The 2016 Sullenger Vineyard Cabernet Sauvignon opens with beautiful plum and black cherry aromas underscored by delicate notes of herb and earth. Layers of soft, juicy cherry flavors spread across the palate, while firm yet silky tannins are balanced by bright natural acidity on the finish. The resulting wine possesses a lushness and depth that is both immediately approachable yet structured to evolve beautifully over time. 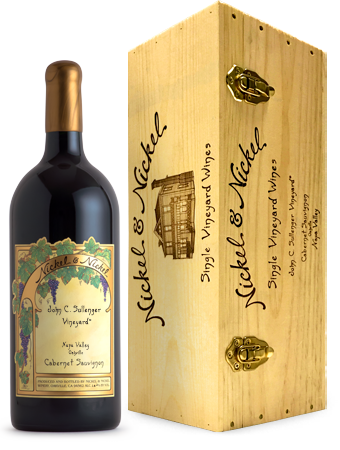 The home vineyard of Nickel & Nickel, Sullenger Vineyard is situated behind the winery in the heart of Oakville and is named for John C. Sullenger, who settled the farmstead in the 1880’s. The vineyard’s 30 acres of clay loam soil are planted exclusively to Cabernet Sauvignon, with 2 rootstocks and a few different clones which each add a unique element to the resulting wine.